Pioneer Windows and Doors is a Toronto single hung windows supplier, providing single hung windows that are classic in its design and look and have more contemporary features of a UPVC window. Our Toronto single hung windows are designed and installed for easy operation, offer a stylish look and are made with triple weather strips. By using our fusion welded technique, the corners of the window are welded to maintain the window’s strength in all weather conditions and usage.Each single hung window we supply from our Toronto facility also has specific safety features such as interior glazing beads and child-safety locks.With our single hung windows in Toronto designed for great energy performance, noise reduction and strength, we ensure our customers are receiving single hung windows that they will enjoy for many years to come. 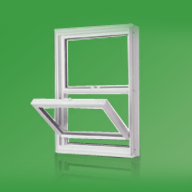 We back our single hung windows with a lifetime warranty. To better serve our customers, we offer our single hung window supply and installation in Burlington, Mississauga, Pickering, Kitchener, Waterloo and the entire Greater Toronto Area (GTA).